Euclid knew that using similar diagrams over and over again, each time looking at them in a different way, was a powerful way to see mathematics as a connected whole. Euclid used similar diagrams several times throughout his Book 2 and Book 13 to provide visual reasoning contexts for relationships between segment lengths on straight lines. If the line AB is halved at the point C, and D is another point anywhere on CB, then CB2 = CD2 + AD × DB. Readers of Euclid get used to knowing that lengths squared need to be drawn as squares, and two lengths multiplied together need to be represented as rectangles. I shall draw these in, but leave it for you to follow through the reasoning. In my diagram DB = BE. Now that you have got to grips with the diagram, suppose that AC = CD and DB is any length (DB = BE). What relationships can be found between the segment lengths? Now experiment with different ratios along the base line. If AC = 0 and CD and DB are any lengths (DB = BE), what can be said? If AC = 0 and CD = BD (DB = BE) you should get something fairly simple. You might like to ask your students to express all these relationships in terms of x and y (or only x in the last case). Below, I have designed a matching task in which theorems and diagrams can be paired together: which diagram helps you to ‘see’ which theorems? It is not a one-to-one matching, and the language is difficult to understand, but think of it as a bit of historical detective work. Health warning: this has been trialed with teachers but not with students. 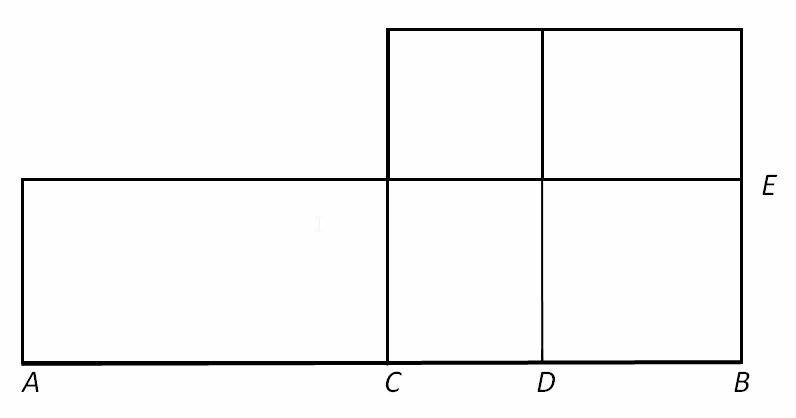 The complements of the parallelograms which are about the diagonal of any parallelogram are equal to one another (this means that if you draw the diagonal of any parallelogram, and split the original parallelogram into two similar ones along the diagonal with some bits left over, the bits are equal in area). 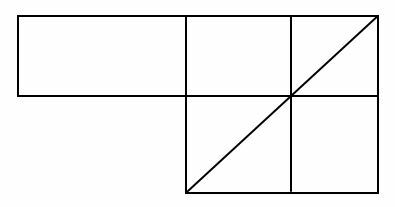 If a straight line be divided into any two parts, the square on the whole line is equal to the squares on the two parts, together with twice the rectangle contained by the two parts. 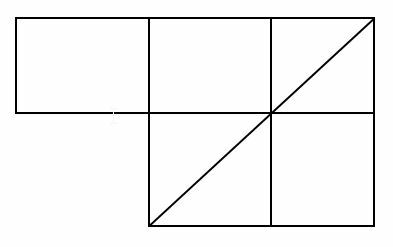 If a straight line be divided into any two parts, the square on the whole line, and on one of the parts, are equal to twice the rectangle contained by the whole and the part, together with the square on the other part. If a straight line be bisected, and then extended (produced) to any point, the rectangle contained by the whole line thus produced, and the part of it produced, together with the square on half the original line bisected, is equal to the square on the straight line which is made up of the half and the part produced. If a straight line be divided into any two parts, four times the rectangle contained by the whole line and one of the parts, together with the square on the other part, is equal to the square on the straight line which is made up of the whole and that part. 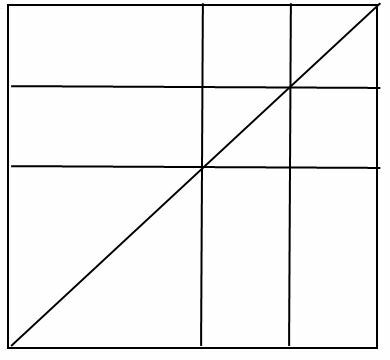 If a straight line be divided into two equal parts and also into two unequal parts, the rectangle contained by the unequal parts, together with the square on the line between the points of the section, is equal to the square on half the line. 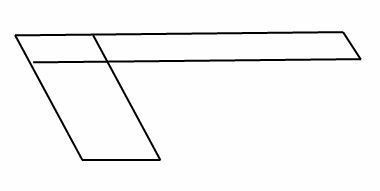 Parallelograms which are equiangular to one another have to one another the ratio which is compounded of the ratios of their sides. 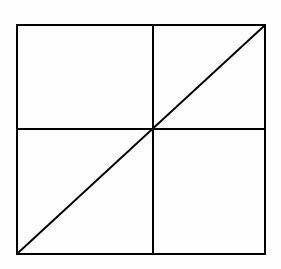 Parallelograms about the diameter (this means diagonal) of any parallelogram are similar to the whole parallelogram and to one another.